Happy Tuesday everyone! I can’t believe it…this time next week…I’ll already be ‘back to school’. We start on Monday. GEEZ!!! Where did the summer go? So the SUO Challenge this time is cards without greetings. Now I have to say…this was a real challenge for me! I don’t feel a card is finished unless it has a greeting on it…LOL!!! So this one was TOUGH!!! Decided if I put a REALLY big flower on it, maybe it won’t feel so naked! I also thought I’d pull out a color I NEVER use – Wisteria Wonder! Looks pretty with Mint Macaron! Wisteria Wonder – 4 1/4 x 11 folded. 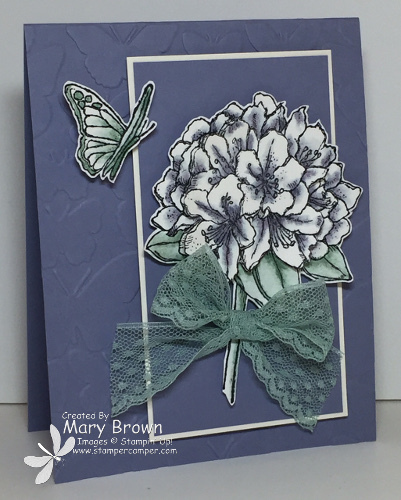 Run through the Butterfly Embossing folder. Wisteria Wonder – 2 1/2 x 4 1/2, layer onto Very Vanilla – 2 5/8 x 4 5/8, add to card front using dimensionals. Watercolor paper – stamp flower two times using StazOn Jet Black, color flower using blender pen and Wisteria Wonder Marker, color leaves/stem using blender pen and Mint Macaron Marker. Cut out one full flower and just part of the other flower, layer and add using dimensionals. Watercolor paper – stamp butterfly using StazOn Jet Black, color using blender pen and Mint Macaron marker, cut out and add using dimensionals. Tie bow from Mint Macaron 1″ Lace Ribbon and add to flower stem to finish it off. Don’t forget to check out what the rest of the design team to see their beautiful butterflies! This entry was posted in SUO Challenge and tagged Best Thoughts. Bookmark the permalink. Beautiful card – very nicely done.